Details from a Defense Ministry report show that Moscow is not happy with Norway’s attempt to establish absolute national jurisdiction over Svalbard and its shelf. It is the newspaper Kommersant that refers to the report after speaking to several sources in the Russian Defense Ministry. The report summarizes Russia’s 2016 national security assessment in the field of maritime activities. The military part of the report describes existing foreign policy problems, like U.S. and their allies attempt to limit Russia’s geopolitical influence. Listing reasons for potential military conflicts with NATO, the report singles out a separate threat from Norway, because of the country’s plans for unilateral revision of international agreements. The report stresses that Norwegian authorities are seeking to establish «absolute national jurisdiction over the Spitsbergen [Svalbard] archipelago and the adjacent 200 nautical miles maritime boundary around,» Kommersant writes. The report gets wide coverage also in other Russian media on Tuesday. In addition to Svalbard, the report lists the Kuril islands and the Azov- and Black Sea region around Crimea as potential war areas for the navy. Norway argues the Arctic is an area of cooperation rather than conflict. A dispute between Norway and other signature countries to the Svalbard Treaty, however, is whether the Treaty applies to the shelf around Svalbard or if Svalbard does not have its own shelf but being a part of mainland Norway’s continental shelf. Russia has several times the last few years stressed its disagreement with Oslo over Svalbard. In 2015, Norway’s Foreign Ministry summoned Russia’s ambassador to Oslo over Deputy Prime Minister Dmitry Rogozin’s surprise visit to Longyearbyen airport and the Russian settlement Barentsburg. Rogozin is on Norway and the European Union’s list of sanctioned people not allowed to enter the territory of Norway due to their active participation in the annexation of Crimea. Rogozin’s visit to Svalbard was first reported by the Barents Observer. Russia’s Defense Ministry report was late in September sent out to members of Government’s Maritime Board led by Dmitry Rogozin, Kommersant writes on Wednesday. The NATO meeting triggered widespread coverage in Russian media. Sputnik News, another arm of Rossiya Segodnya, published an English version of the statements questioning Norway’s historic rights over Svalbard. 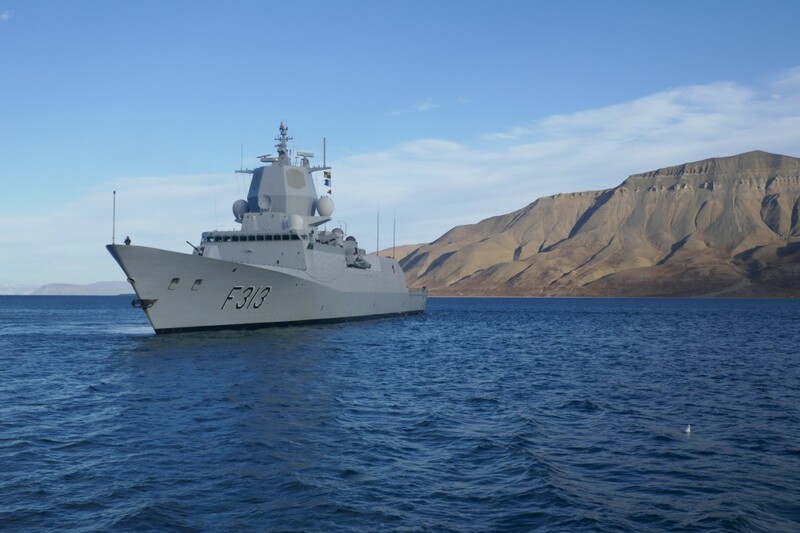 Last month, the Norwegian navy frigate made port call to Longyearbyen. Norway does not have any military installations on Svalbard, but in recent years, a navy vessel shows presence in Svalbard waters once a year. In April 2016, Chechen special forces instructors landed at Longyearbyen airport on their way to Russia’s Barneo ice-base in the high Arctic. Geir Ulfstein, Law Professor at the Department of Public and International Law at the University of Oslo told the Barents Observer after the Chechen special forces’ visit that an interesting question concerning the kind of use of Svalbard that we now are witnessing, is how far Article 9 of the Treaty reaches when it comes to prohibition of the use of Svalbard ‘for war-like purposes’. “But in this connection it is central that Norway has the sovereignty over Svalbard. Norway can prohibit paratroopers on Svalbard in the same way as on the mainland, unless other countries can claim concrete rights as a consequence of the Svalbard Treaty. It is hard to see how Russia could find any such rights in the Treaty,” Ulfstein said. In March 2015, Russia’s Embassy to Norway wrote a sharp diplomatic note to the Norwegian Foreign Ministry, stating that the opening of three blocks for oil drilling in the Barents Sea near Svalbard is in defiance with the Svalbard Treaty, the newspaper VG reported. Russia believes the blocks that where announced in the 23rd licensing round belong to the Svalbard continental shelf and that production of oil and gas there should be regulated by the Svalbard Treaty. In the Svalbard Treaty Norway and 39 other countries have the same rights to operate in the archipelago, provided that they comply with Norwegian law. The main difference between Norwegian and Russian views on the areas around Svalbard, is that while Russian claims that Svalbard has a shelf of its own that should be covered by the Svalbard Treaty, Norway argues that the continental shelf is a part of mainland Norway’s continental shelf and should be governed by the 1958 Continental Shelf Convention.